Researchers identify key molecule which halts transcription of cell’s genetic code. When cells are normal and unstressed, the molecule keeps transcription moving so that genes are ‘expressed’ and RNA is jotted down more quickly. When cells are stressed and transcription runs into a glitch caused by damage to the DNA, it marks the machinery to be disassembled. Now, researchers at the Stowers Institute for Medical Research have shown that a molecule called elongin A plays two roles in the transcription process. The team have discovered how the molecule morphs between these two alternate identities, one as facilitator and the other as destroyer. The opensource study is published in the Journal of Biological Chemistry. The team explain that for any cell, transcriptional regulation and gene expression is a very delicate balancing act. If the machinery gets stalled on a gene it becomes a physical block to transcription. That can have a devastating effect if the gene is a tumour suppressor gene or an essential survivor gene, and it can’t be transcribed until the machinery is removed. They go on to add that understanding how elongin A helps to disassemble the transcription machinery gives an insight into diseases like cancer that can result when genes are inappropriately turned on or off. Previous studies show that to turn a gene on, parts of the transcription machinery proceed in a stepwise fashion along specific sections of DNA in order to convert the genetic information in the DNA into a working copy of RNA. Transcription doesn’t always go smoothly, and the machinery stutters occasionally when it gets a bit askew or off track. It can also stall or stop altogether when it hits a glitch, a section of DNA that is damaged from exposure to ultraviolet radiation or just simple wear-and-tear. For almost three decades the team have studied the fundamental mechanisms that drive transcription. Many of their discoveries have centered on elongin A, a molecule that plays two parts in this process. Elongin A helps to elongate the strands of RNA that come out of the transcription machinery by speeding up the rate at which DNA is copied into RNA. In addition, it helps to get rid of stalled polymerases by bringing in molecules that tag the machinery for disposal. In the current study the team sought to understand how elongin A switches between these two roles. They knew that in the former role that elongin A partners with its sister proteins elongin B and C, however, in the latter role it also brings in another protein called Cul5. Therefore, the researchers decided to track its association with Cul5 as a way to monitor its behaviour in the cell. The researchers exposed an entire plate of cells to ultraviolet irradiation to induce DNA damage. They found that elongin A formed a complex in the irradiated cells, however the complex was not present in healthy cells. In a separate experiment, they used a laser to draw a single line of damage across the DNA that could be visualized under the microscope. 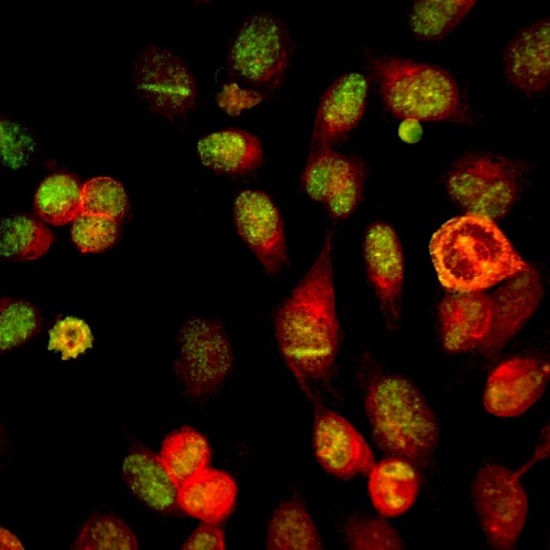 By using fluorescent labels to color elongin A and Cul5, the researchers found that these proteins rapidly accumulated at regions of localized DNA damage. Next, the researchers wanted to determine what kind of signals could cause elongin A to assemble with Cul5 and form a complex called a ubiquitin ligase. The data findings had already shown that DNA damage could do the trick. However, the team needed to investigate the case where the transcription machinery stalled in the absence of any DNA lesions or the cells were stressed by other means. The researchers treated cells with a slew of drugs that generated lesions in the DNA, blocked the polymerase, or simulated nutrient starvation, and found that they all triggered elongin A’s shift in roles. The results showed that various stimuli that lead to big changes in gene expression and weren’t known to stall the polymerase also caused this shift. The team hypothesize that it’s possible the ligase forms under these circumstance just in case the polymerase gets ‘stuck’ on some critical, newly activated genes. On the other hand, these results raise for the first time the possibility that elongin A may play a positive role in gene activation by some mysterious mechanism that needs to be understood with further investigation. The team surmise that one possibility is that a stuck polymerase is the primary signal. However, there may not be just one signal. There could be differences between signals that drive assembly after DNA damage and other stimuli like stress, nutrient starvation, or retinoic acid signaling. The researchers state that they plan to pursue this avenue in future studies. They will also continue to explore the variety of signals that shape the behavior of elongin A in hopes of elucidating its roles in the cell. Elongin A (green) and CUL5 (red) in cells enrich at sites of localized DNA damage. Credit: Conaway Lab, Stowers Institute for Medical Research.